Pilates Workout Video for You! Looking for a good workout? Well...I have the Pilates workout video for you! Whether you are looking for a good beginner Pilates video or a more challenging Pilates core ball workout DVD I have them both. Here is a sample of my Pilates ball video on Youtube and what you can get for yourself right here on my site. 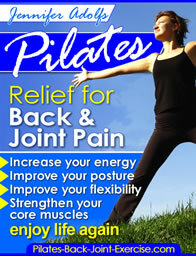 A good Pilates workout should incorporate the classic mat exercises with variations and modifications for all levels. You can find all of the Pilates workout video exercises and more of the classic mat exercises with 3 levels of progressions in my newly revised Pilates ebook available here. That is exactly what these two videos will do for you! The video exercises are outlined so that you will begin with a gradual warmup incorporating spinal articulation moves such as the bridges and roll ups or hundreds. Once the spine is warmed up then you will work into some deeper core moves that will really challenge the abdominal muscles such as the: Hundreds, Leg Circles, Single and Double Leg Stretches, Spine Stretch forward, and Rolling like a ball. You can find all of these exercise moves and more on my exercise of the month page here. Next, this ball exercise video will move into some side balancing and bending exercise designed to really work the obliques and widdle your waist. The side kicks and side bending exercises are important as they challenge your body in a different plane of motion, while working the lateral thighs and waistline. Finally, in your workout video you will finish with back extension or prone exercises that will help with your upper and lower back strength. These Pilates exercises are great for helping to improve your posture as they work on the muscles of the upper and middle back to help keep your bones strong and the spine straight.